This short story gave me perspective as a principal and teacher. I remember as I progressed in my career, moments of misbehavior from students affected me less emotionally because it often had little (if anything) to do with me, and everything to do with what was going on with the student at the time. I just learned to breathe and calm down and get to the heart of what was going on. It wasn’t that I didn’t care about what my students were going through; I just realized that it was often not a reflection due to our interactions. Something else was often going on. The next time you struggle with a student, colleague, or someone in your personal life, remember this Covey story. There is probably a more significant side to the story that you are not seeing. This short clip, says so much about us as educators as well as our students. This is something I have been thinking about a lot lately. This last one is so simple and complex at the same time- maybe that’s just me though. In a way, it requires vulnerability to express gratitude. I have a framed quote in my office that says, “start each day with a grateful heart.” But, to be honest, I am not always as intentional as I could be about this practice on a day to day basis even though I am so grateful for all I have and really appreciate when people share their gratitude with me. I do my best to show gratitude to those closest me (I could get better), but I know that I have been bad at showing appreciation for things in my life. It is easy to get caught up in deficit thinking, but I have been trying to start my morning off with thinking about three things I am grateful for in my life. It has helped me start on a positive note even when I am having a tough day/week mentally and emotionally. But one thing I am truly grateful for is that I have people in my life that I can contact and say, “Hey…I need a pep talk.” And they never fail me. Sometimes I don’t listen to what they say, but I always realize that I am grateful that I can count on them for saying it. Surround yourself with people that fill you up. As I have grown older, I have realized that a small circle of those people in your life who are willing to have your back and fill you up, is much better than a large circle that has no interest in doing the same thing. The above image is a draft visual that is the basis of my next book, “The Core of Innovative Teaching and Learning” (working title) which connects “The Innovator’s Mindset” and Universal Design for Learning (UDL). I am blessed to have Katie Novak writing this book with me as her brilliance and expertise is something that I know so many people will benefit from in reading the book, as I have benefitted tremendously in writing alongside her. She takes UDL and makes it extremely accessible for all educators while providing practical strategies for teachers that they can use, iterate, or hopefully, spark new ideas. This book is focused on providing strategies for teachers through Katie’s amazing examples that she weaves throughout, but since we focus on learners, we hope to see administrators see the value of mirroring these opportunities in their community. The book is separated into parts based on the visual above. Part 1 is on the first two circles. Those four areas are meant to “set the stage” for learners. “Relationships” is listed in the middle because without a focus on it, the other three strands will not be as effective. And in Part 3, we discuss some of the opportunities we have to lead from where we are and how important it is that we not only focus on the “whole student” but the “whole educator” as well. We also discuss “Innovative Teaching and Learning” is not focused on only doing the “latest and greatest” for our students. It is about finding new and better ways to serve our learners, whether through a traditional practice or a new idea. The book will be out soon, and I look forward to sharing more information as the release date gets closer. I just wanted the opportunity to share the visuals out with the world. Feedback is appreciated. Catherine makes an excellent point. I have been lucky to not only work for administrators that embody the feedback but also work alongside administrators currently that do remove barriers for their staff to incredible heights. As an administrator, we have to recognize that teachers don’t have full plates, but full platters. Don ‘t ever add anything to the platter without explicitly communicating things that can come off. Less is more if you want things to be done well. In my experience as an administrator, I filtered as much as I could away from my teachers that was not necessary. There are things you will do as a teacher that no one ever told you about in “teacher college” that are boring, tedious, and seemingly have little purpose. That is the reality of the job. But there are WAY too many things that are put upon teachers that are not necessary (i.e., the million surveys that seem to come around January and February). Filter away. It is rare (if ever) that people want to do a lousy job. Guidance and coaching work better than ridicule and negative reinforcements. There is a balance between “getting out of the way” and leading from the front, side, or back. A simple question to think about as an administrator; am I creating barriers or pathways, and how is that helping my staff maximize their potential? I am sitting in a Starbucks, and focusing on writing. I tend to come to this place because I know the taste of what I am going to drink, and I also know that I can work with people in my vision, but in isolation with no interruption. I like the “routine” of it all, but also know that with a large pair of headphones, I can concentrate and get things done without any interruptions from others. I have done more writing in a Starbucks than I have any other place in the world. There is so much focus on collaboration in education. I think the ability to work with others is crucial, but I also don’t think we have to do it all of the time. Whether we are face-to-face or online, we almost can be overconnected unless we decide to disconnect ourselves. 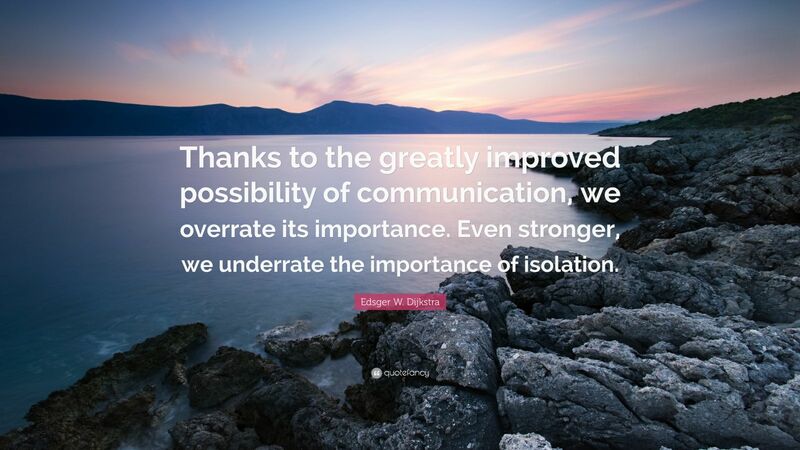 Human connection (face-to-face) is essential, but so is human disconnection. We need to learn to be able to be alone and work alone. I watch my daughter playing, and sometimes she walks into another room, grabs some toys, and takes some time to herself. She is not worried about what I am doing or what is happening on social media. It is just her and her thoughts with no around but her. I don’t know why she does it or when it is going to happen, but as much as I love her being around me, I also love that she sometimes sits on her own with no prompting. I don’t even know where I am going with this or why I am writing it. Working in isolation right now, this is what I started thinking about, and I just chose to write it down. This time I have created for myself to process my thoughts is invaluable to me and something, I think many students could benefit from in schools. Reflection on our own is crucial to moving forward. Successful people live by a different set of rules. Collecting accolades, reaching the top of the corporate ladder, or acquiring riches isn’t as important as having a calling, pursuing a dream, and changing lives. Successful people inspired by a mission strive to leave behind a legacy. Fair warning, though: When all is said and done, it’s really not about you. It took years for me to develop the understanding that life is about giving, service, and meaningful relationships. As an adult, your version of what “success” looks like could and should be different from mine. But how “success” is often portrayed in society, can send a message to students that their success is not as valuable as the success of someone else. Is the success of the school more about what the adults deem as “success” and a measure of their work as opposed to what the students do, create, and act? From my travels, I have seen more schools, classrooms, and teachers, help students understand and strive for success that is based more on “purpose” rather than basing it on extrinsic value. I appreciate when those conversations are had because it helps students feel valued and that although paths can be different, they can still have tremendous value to ourselves as individuals. 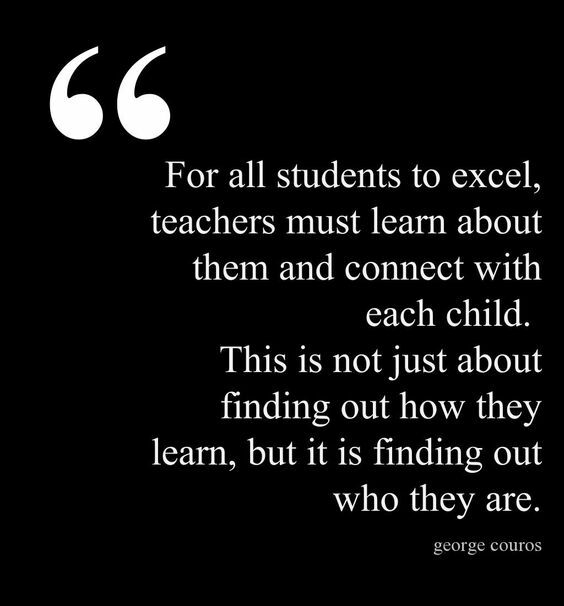 This is important to note…Adults are there to help students and the conversation regarding success is something we can help guide our students on. But, excluding them (students) from the discussion is not helpful now or in the future. Personal development books are only as helpful as the action we take after reading them. All the methodologies and frameworks in the world won’t impact us if we can’t process them properly. Reading counts when it’s retained and put into practice. 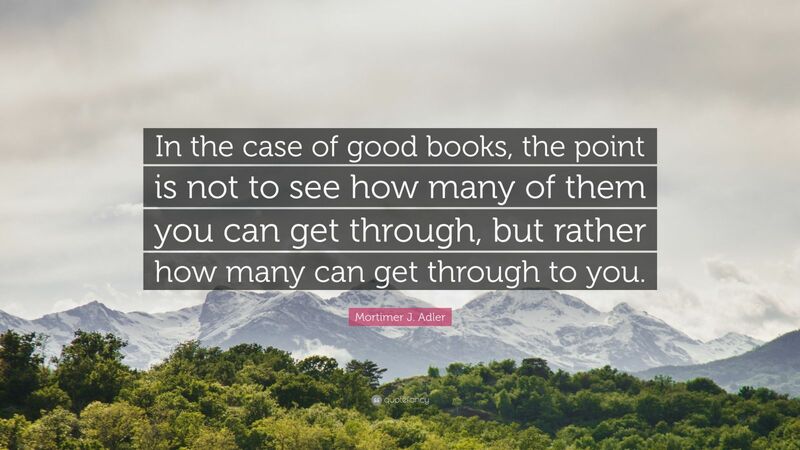 When I first read this post, it was a nice counter to all of the “I am going to read 100 books this year posts!” The article distinguishes between reading for pleasure (which is more likely to stick) and reading for personal growth. The notion of creation is so imperative to the work that we do in education. I saw someone write something to the effect of “95% of people online consume content, and only 5% create.” I have no idea the accuracy of the validity of that statement in the context of the Internet, but it does give me pause when I think about education. Do we encourage our students to meaningfully create (meaning that it is meaningful to them) or do we have an over-abundance of consumption? It is not that consumption is terrible (it’s necessary), but it recognizes that both are important if we are to focus on depth of learning. If we are going to change this, we have to think differently about our professional learning opportunities? For example, conferences try to jam pack as much content into a day as possible because there is this false notion that this provides value. What if during conferences or PD time, we scheduled times for participants to create something of meaning during the day, instead of assuming that “PD” time is about consumption and the “creation” part is meant to be on your time? We have to be more thoughtful of how we do this in our learning so we can understand how shifting these experiences in our practice can help improve learning in our classrooms. While standing in line at a store today a young man approached me and said, “Hello Mr. Worthington.” He has grown a lot since I saw him last (+/-5 years), and I didn’t recognize him (I guess I’ve aged well because he recognized me!) Once he said his name I said hello and gave him a hug. We chatted briefly before he had to go. I thanked him for coming up to me and saying hello. I know (as do most people in education) that what I do has an impact on kids, and that I have an important role in guiding and educating the next generation. Moments like today remind me that students also have an impact on us. As I drove home the positive emotional impact hit me, brought tears to my eyes, and really filled my bucket. This young man, for reasons beyond his control, has had to overcome more obstacles than a child should. My time with him had its ups and its challenges. I’m a better educator and person for having known him. I hope my impact on him was equally as positive, and I hope this post finds its way to him. Him choosing to come say hello, although small in action, was large in impact, and reminds those of us in education why we do what we do. Les is the real deal, and from knowing him and seeing him work directly with students, I could feel the emotion in his post. My hope as an educator was not to solely “prepare kids for the future” but to help them build a better world than we have currently. Although, we all can have frustrating days as teachers when students challenge us, how we interact in those moments, as Les reminds us, will model a way for our students in the future. I remember getting frustrated with students early on in my career when they were “acting up” but, again as Les reminds us, many students are going through things that I would struggle handling as an adult. When you feel them struggling, the trick is not to “love less” but to “love more.” Students need to know you have their back especially when they are struggling. I remember one mom being upset with the progress of her child and I kept reminding her that kids develop in different ways at different times, and we just needed to be patient. Her son grew up to be a fantastic person because our focus as a team (educator and parent) was to not focus on the “right now” but to focus on the child’s future and be patient with the pathway they were taking. This is not about being “soft” on kids at the moment but just to remind me to be patient and persistent. On days when we struggle, it is essential to look back on how far a child has come, as to become frustrated where they are in that moment. I loved the post from Les. It gave me several reminders on the incredible work of educators being done everywhere.